If you didn’t get your fill of stylized Irish folklore from the animated feature The Secret of Kells, Song of the Sea will satisfy you. Ben grows up with his father and his little sister Saoirse (pronounced “Seer-sha”). Saoirse is 6 and doesn’t talk yet. They all live in a lighthouse on the edge of a cliff on a coastal island. There is magic and mysticism where they live. Another uninhabited rock near their island has a giant face. Ben knows lots of stories about selkies (seal-people) and fairies, told to him by his mother when he was little. Ben has a seashell his mother gave him, and when his little sister blows on it, glowing white sparks appear. Even Saoirse’s muteness and her fascination with the sea seem magical, as though she herself might be a selkie. Along with Ben and father (David Rawle and Brendan Gleeson), the family includes their chubby English Sheepdog named Cú who serves as protector and comic foil. And Grandma (Fionnula Flanagan) drives her smelly, smoggy car from the city to the island by way of the ferry. The story takes off as the children begin to understand that Saoirse probably is a selkie, and that their mother was too. Father and Grandma pull the story toward the real world, but the power of mother’s magical heritage pulls harder in the other direction. 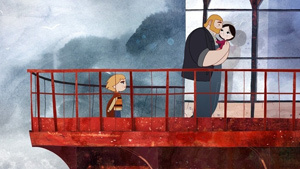 If you’ve seen The Secret of Kells, you’ll recognize the visual palette of Song of the Sea. Tomm Moore directed both. Backgrounds have a square-on 13th-century primitive quality to them. Characters are drawn flat with strong lines. Everything has a bold geometric shape, including characters’ heads and bodies. All of this is aided by computers to create continuous, fluid motion. The story has a fairy-tale quality to it. The children are the main focus; there is a missing mother; there is scary magic in the wide world. I suppose I wished there were more in the film for my own sensibilities — something darker, or more intricate, or morally complex. But Song of the Sea seems to be aimed at a younger, more innocent audience. The film did manage to hold my jaded interest for the duration. My favorite segment involves Ben in his grandmother’s car on their way into the city. He wanted to stay home with dad, so he is in the back seat, drawing a map so he’ll know how to get back home when he escapes. The map is a crude drawing that nevertheless overlays neatly with the film’s own version of their route to the city.